We will inform you as soon as the course is available. Sorry, we could not add your email-address. Register now at no cost and discover more! COMPLETELY FREE OF CHARGE – THANKS TO THE SPONSORSHIP OF THE STÄDELSCHER MUSEUMS-VEREIN E.V. Experience “Art History Online – The Städel Course on Modern Art” – at no cost and exactly when it suits you. 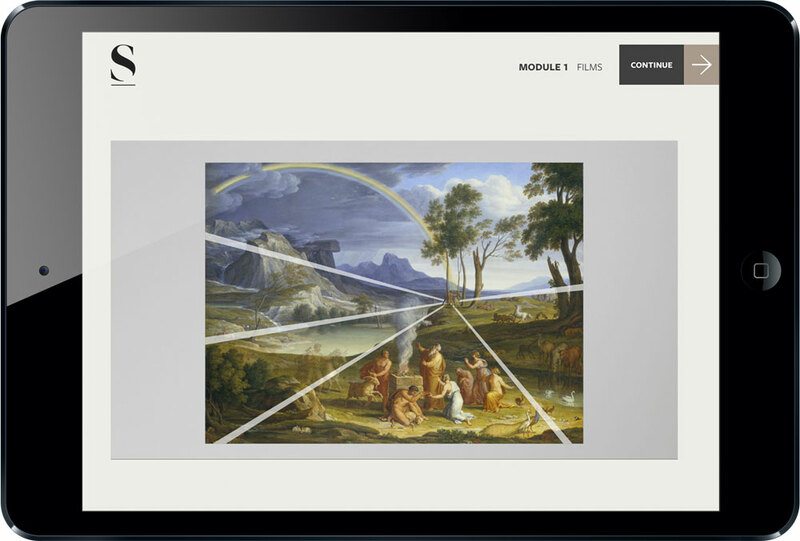 Learn about art history and visual studies in a richly varied way as you proceed through the five modules of the course on your computer or tablet at your own pace. Based on roughly 250 selected works from the collection of Frankfurt’s Städel Museum, the course provides you with multifaceted insights into modern art, from 1750 to the present. The competent and entertaining moderator Sebastian Blomberg, a stage and screen actor, guides you through the course. With a multimedia combination of film, texts, playful learning formats and a comprehensive timeline, you are concisely and clearly presented with expert theoretical knowledge. The sounds of the Berlin musician Boys Noize accompany the learning experience. WHAT DO WE SEE WHEN WE LOOK AT A PICTURE? 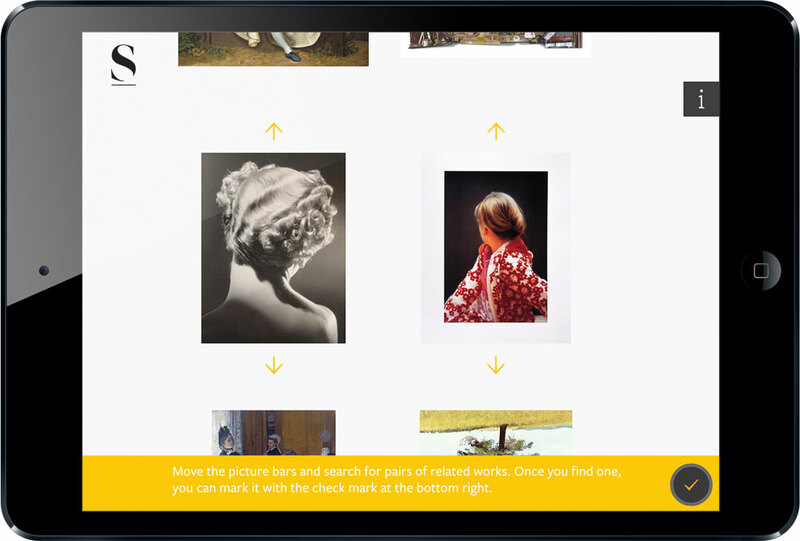 LEARN HOW TO ANALYSE A PICTURE’S FORM AND MOTIFS. INVESTIGATE HOW ART IS IMPACTED BY SOCIAL, POLITICAL AND CULTURAL DEVELOPMENTS. ARTWORKS ARE CREATED IN THE CONTEXT OF OTHER WORKS. DISCOVER THE MANY INTERRELATIONSHIPS IN ART. WHAT TASKS DOES A MUSEUM PERFORM? HOW IS ART PRESENTED? EXPLORE THE COMPLEX INTERRELATIONSHIPS IN THE ART WORLD. As you work through the modules you will encounter various topics that progress thematically. 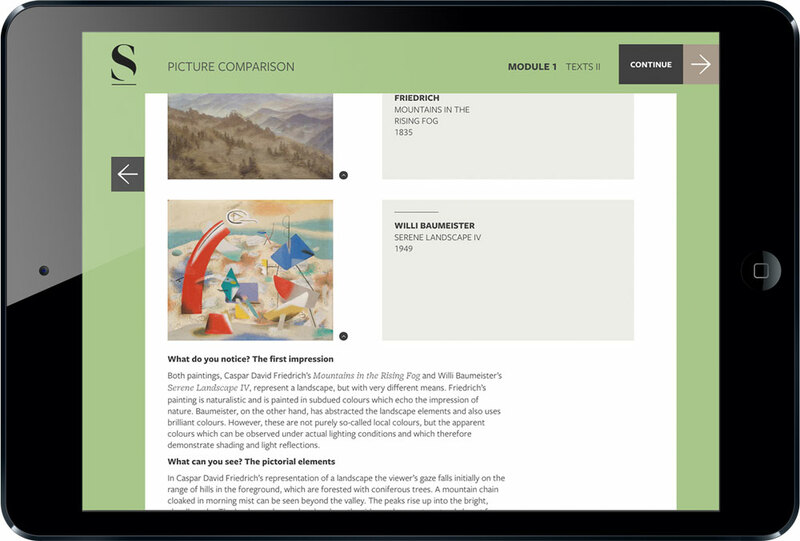 Your understanding of works of art from 1750 to the present will be developed through questions and tasks that help you form your own critical response to art. You can test the knowledge you have acquired in various tasks within each module. Throughout the entire course a timeline is also available to you as an important aid to orientation. There you will find a wealth of background information about works, artists, styles and schools, as well as historical, cultural and political contexts. 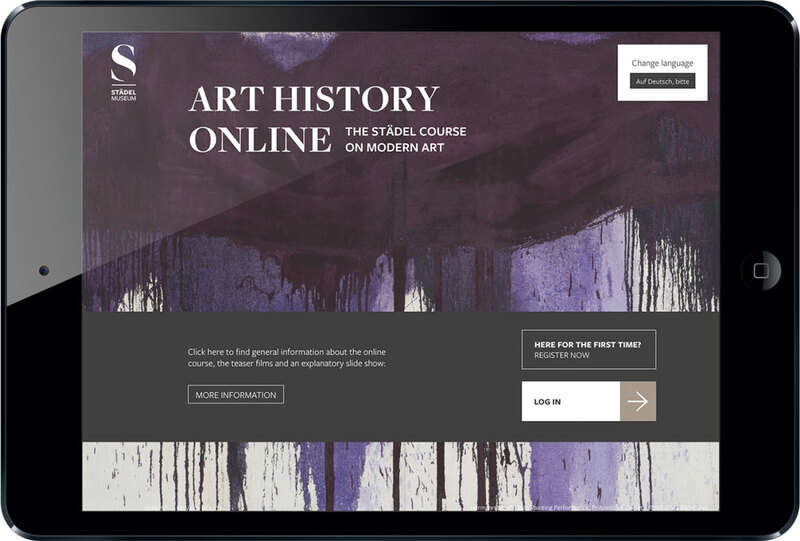 Whether you already have a basic knowledge of art history or simply enjoy looking at art, “Art History Online – The Städel Course on Modern Art” will offer you fresh, enjoyable insights into art history. It is an ideal accompaniment to self-study and continuing education. 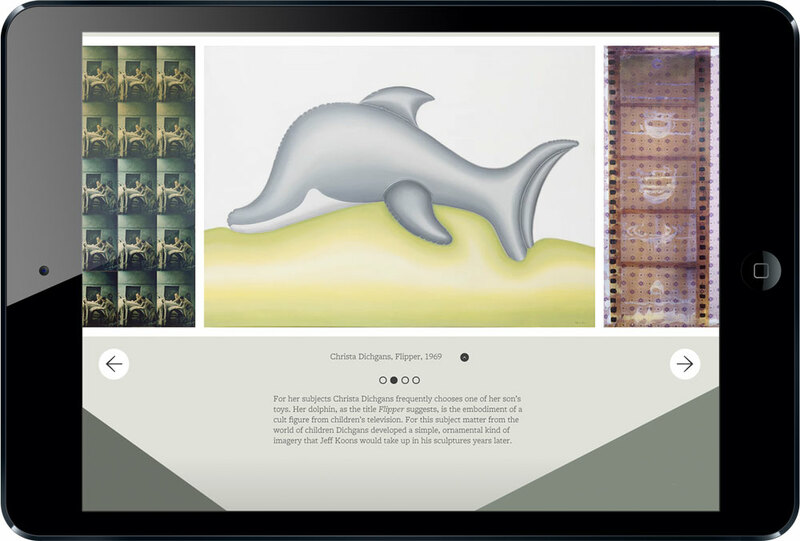 The online course was developed by the Städel Museum in collaboration with the Art History Chair and the Centre for Digital Cultures at Leuphana University of Lüneburg. The online course is sponsored by the Städelscher Museums-Verein e.V. 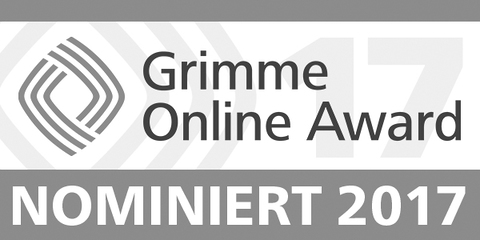 with support from the Christa Verhein-Stiftung. What a splendid idea and successful result! You captured my attention hour after hour and the genre of modern art which I had eyed somewhat suspiciously up to then, became accessible to me. This is the best digital tool that I have ever seen and used. It is a great delight to learn more about art with this course. I studied art history myself and regard this online course as a brilliant way of arousing interest in museums. My friends and acquaintances are also excited about it. It was with great enthusiasm and pleasure that I worked through the modules. From my point of view - I am in IT and for me art is the antipole to one and zero - both the concept and the implementation are very well done. I don't know of any media project which is so convincing and of such high quality as this one: outstanding design, excellent media implementation, a great visual experience, an exciting treatment of contents, highly aesthetic, informative and entertaining with a personal guide throughout. Thank you so much. I will certainly recommend you. This is great! It is a good way to stay in touch with you across the Atlantic. Thank you so much. I am very much looking forward to the course. Registering is simple, and you can start the course immediately. At the beginning of each module the actor Sebastian Blomberg introduces you to the given theme in a short film. Informative texts supplement and delve into the module’s main points. Brief explanatory animated films help you gain a better sense of selected works and themes. Playful tasks allow you to immediately apply and test your newly acquired knowledge. The timeline is available to you throughout the course as a valuable resource and aid to orientation. 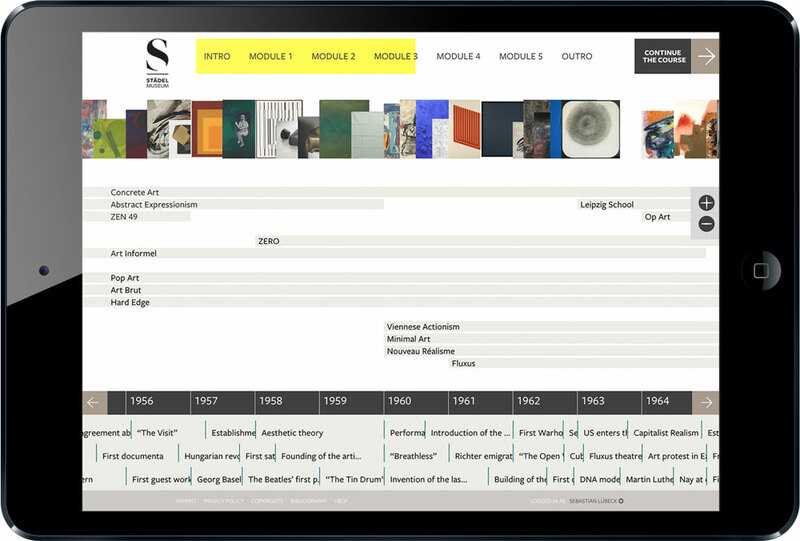 There you will find a wealth of information about various movements, artists, historical events and important works of modern art – visually structured and designed to be readily accessible. At the end of each module, its content is once again summarised and critically analysed.